We all instinctively know that age has an influence on which parties people vote for. So I thought it'd be an interesting exercise to visualise the relationship between voter turnout by age and party votes in each electorate. By using the age segments from my analysis of the youngest, oldest, most and least representative electorates, I've compared how electorates with above average shares of each of those segments voted relative to the overall party vote average (not the total party vote share) across the country. The results are much as you'd expect, National is skewed towards voters aged 50 and over, Labour is skewed towards voters 49 and under. NZ First mimics National but with a much greater spread, and a similar situation presents itself for the Greens mimicking Labour. For the Māori Party I've only looked at General Electorate seats, largely because in the Māori Electorates there's not much of a difference between each of the electorates in terms of age segments. TOP I included only after I realised that their increased support in the 18-34 segment was interesting from the perspective that in Wellington Central and Ōhāriu, they would have been competing more with Labour and the Green Party for those votes, than they would have been with National or NZ First. You could in theory argue that these numbers represent a likelihood of a certain age segment to vote a given way, but I think they're only indicative of that, as there are other factors at play, e.g. urban vs rural, affluent vs deprived, tertiary educated vs those without degrees, that will also influence these. Even so, it helps contribute to our overall understanding of the electorate and how it voted this election. In electorates with an above average share of Youth voters (those aged 18-34), National on average performed 11.01% worse (around 5.10 percentage points) than they did on average across the country. For Labour they performed on average 14.68% better in these electorates (5.25 percentage points) than nationally. The big differences though were NZ First who under performed here by 23.59%, and the Greens and Māori Party who over-performed by 20.87% and 22.18% respectively. As shown in the first graph, TOP's support, while having less of a spread than the other parties, over-performed in this segment. Unsurprisingly, as our voters become older and we enter the Mortgage and Family segment, National still under-performs, but only by 2.88%, while Labour over-performs by 7.22%. NZ First and the Māori Party both still struggle in this segment (though I'd caution against assuming that these are representative of the Māori Party's support given the vast bulk of their support does come from the Māori Electorates). Interestingly, the Mortgage and Family was TOP's worst performing segment, coming in at 7.36% worse than there national average. The Empty Nest segment - those aged 50-64 - is the first time we see National and NZ First over-performing their national average, by 7.07% and 14.73% respectively. Labour, the Greens and Māori Party all drop off from our prior segment as well. What I think is really interesting is how dramatic NZ First's support shifted between the Mortgage and Family segment and the Empty Nest Segment. The Super segment - those aged 65 and over - sees NZ First get the lion's share of its votes. National, on the other hand, actually fairs slightly worse than it did in the Empty Nest segment, getting just 6.63% more of the party vote on average. What's also interesting here is that both National and Labour's support didn't move as radically as it did as we went through the other segments. National was obviously hurt by some support going to NZ First, but Labour doesn't seem to have suffered as you might expect they would looking at how the Green Party went. TOP's support, while still down on their national average, was better than their Empty Nest segment support though. Hopefully I'll be able to do a bit more in-analysis of each of the age brackets that the Electoral Commission uses. But five graphs are easier to produce than twelve! For the most representative electorates - those that from an age perspective look the most like the average of all the electorates, I've looked at the average deviation is across all of the age groups specified in the Electoral Commission's data. I've also separated out the General Electorates from Māori Electorates for the purposes of this analysis, largely because the Māori Electorates have quite significantly different age demographics than General Electorates as you'll see below. It wouldn't surprise anyone, but out of the youngest electorates, all but Māngere appear in the top 10 electorates for Labour growing its party vote this election (remembering Māngere is already a pretty strong Labour seat anyway). With an average representation of Youth segment voters of 22.9% across the country, Wellington Central sits at nearly double that. Coromandel, Northland, Ōtaki, West Coast-Tasman and Kaikōura had the lowest levels in the Youth vote segment. The same isn't necessarily true the other way though. For the oldest electorates, none of the top five are in electorates where National grew its share of the party vote (the Auckland mortgage beltway), however Rodney is one of National's most valuable electorates in terms of both the share of the party vote won and the high turnout in that electorate, and the other four all did deliver higher party vote shares than National achieved New Zealand-wide. In a similar vein to before, Wellington Central, Mt Albert, Rongotai, Māngere, and Kelston had the lowest levels in the Super voter segment. It's also worth noting the scale of that both Ōtaki and Coromandel had 40.7% and 40.0% respectively of voters in the Super vote segment, with Northland coming in at 34.8%, this is against an average nationally of 24%. However all five of the oldest electorates are in New Zealand First's top 20 electorates for party vote share. No surprise there given Winston Peters' relentless courting of this demographic. 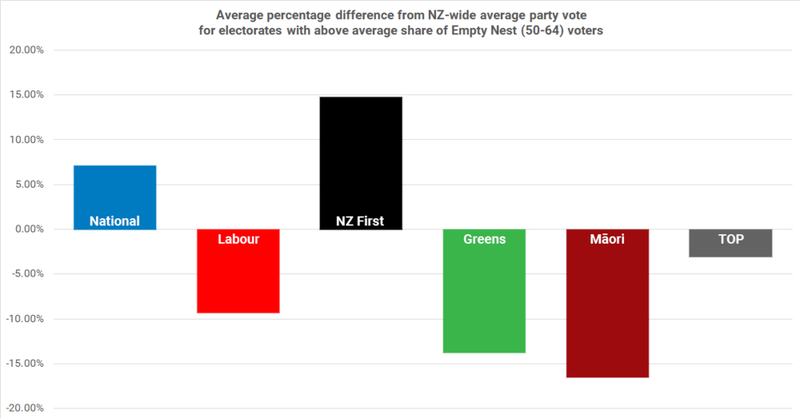 In the Mortgage and Family segment, all bar Kelston (again having a strong Labour party vote anyway) experienced above average growth in Labour's party vote, with the Empty Nest segment imitates the Super vote segment, though to a lesser extent, with only West Coast-Tasman bucking the trend. There they delivering 5pp less in the share of party vote for National, which is split over slightly above what they achieved nationally for Labour, NZ First, and the Greens. The national average for Mortgage and Family was 25.4%, and for Empty Nest is was 27.8%, so neither of these segments produced as big a gaps as the Youth or Super segments. On the flip side, the lowest Mortgage and Family segments were to be found in Coromandel, Ōtaki, Northland, East Coast, and Dunedin North. The five lowest Empty Nest segments were Wellington Central, Maungakiekie, Mt Albert, Northcote, and Dunedin North. When you look at the Most Representative electorates, Port Hills and Christchurch East ranked 3rd and 9th for the biggest net swings fro the centre-right to centre-left. Rimutaka, Tāmaki, and North Shore all experienced above average swings to the left too. In terms of the least representative electorates, Wellington Central and Mt Albert both saw Labour do better than they did New Zealand-wide, with their tilt in representation being skewed heavily towards the Youth and Mortgage and Family segments. Meanwhile Coromandel, Ōtaki, and Northland where the three highest electorates for the Super vote segment, with Northland and Coromandel both being over represented by the Empty Nest segment, and Ōtaki sitting around average. As you might expect, National and NZ First did better in these electorates while Labour and the Green Party under performed in them. With the Māori Electorates one thing really caught my attention - how heavily skewed they were towards younger segments. This is almost certainly because the gap between Māori and non-Māori life expectancy still sits at 7.3 years as of 2013. On average nearly a third of voters in the Māori electorates are in the Youth segment of 18-34, with another 29.7% in the Mortgage and Family segment, and 26.0% in the Empty Nest segment. The Super segment (65 years and over) made up, on average, only 12.2% of voters in Māori electorates. It wasn't a youthquake, but a youth tremor and a greying population have seen New Zealanders aged 35 to 54 squeezed as a percentage of our voting population. With youth enrolments down as a percentage of the overall potential voter population this election, a youthquake was always going to be difficult. However, better youth turnout numbers than in 2014 helped counteract the significant greying of voters in those three years. The good news is that turnout was up across the board, ranging from 6.54 percentage points for those aged 18-24 down to a 0.6pp for those aged 70+. The bad news is that those aged 18-24 made up a lower percentage of overall enrolments than they did in 2014, meaning that their big increase in turnout didn't create a significant change from 2014. Where the big change did occur was with voters aged 25-29, who increased their representation in the actual voter pool by 0.709pp versus 2014, the largest increase of any age group. Their increase of turnout of 5.45pp, combined with their larger slice of the enrolment pie, and to a lesser extent those aged 30-34, delivered nearly all of the increase in youth voters this election. The increase though was largely offset by an increase in voters aged 55 and over. With voters aged 70 and over representing 0.704pp more of voters than in 2014, and those aged 55-59 representing 0.240pp more, it largely balanced out the increases in the youth voter. All of this means that those aged 35 to 54 saw their influence as voters decrease relative to 2014, which was partially driven by their contribution to the pool of enrolled voters also dropping relative to 2014. The biggest drop was in the 40-44 bracket where they contributed 1.026pp less to the final voter pool than they did in 2014. You can find the Electoral Commission's numbers here. Overall there was a marginal greying of voters, going from a median age of 47 in 2014, to 48 in 2017. And in case you're curious, here's the raw numbers. Not only was Gareth Morgan's The Opportunities Party heavily dependent on their 10 most valuable electorates to record their 2.4% party vote total, but they were hugely dependent on the Wellington region, with it providing 15.77% of their party vote tally (I've excluded Ōtaki and Wairarapa from that definition of Wellington). TOP's issues somewhat mirror those of the Green Party. Gareth Morgan enjoys plenty of name recognition in Wellington thanks to him living here, being an owner of the Hurricanes and Phoenix, as well as his other philanthropic endeavours around the city, and his now famous investment in his son's venture of Trade Me, but outside of Wellington, and other urban centres, TOP's support rapidly drops off. Especially damning for Gareth Morgan and TOP is that they grossly under-performed in Auckland, with only Auckland Central, Mt Albert, and Epsom winning a higher share of the party vote than their 2.4% final result (North Shore was right on the cusp). Given the 5% threshold, you either have to perform at, or above that, across most of the country to get in or, like the Green Party, absolutely outperform your national result in a handful of high turnout seats. The problem for TOP is that they weren't able to do either, and they probably weren't helped by the dithering approach taken by Gareth Morgan as to whether he'd stand in an electorate or not. Off the top of my head, Morgan publicly mused that he'd stand as a candidate in Epsom, Wellington Central, and Ōhāriu, but ended up standing nowhere. As I suggested when reviewing New Zealand First's results, there appear to be clear benefits for your party vote results if you do stand either a competent or high profile candidate in an electorate. And when you're trying to get a fledgling political party like TOP off the ground, they probably needed Gareth Morgan to descend from his ivory tower of pontification and do just that. Ōhāriu, Rongotai, or Wellington Central were probably the most logical choices for Gareth Morgan to do this. If, as TOP would have us believe, they had the best policies and people who value good policy would vote for them, then surely the three electorates that are saturated with public servants who live and breathe policy, would be the ideal place to maximise your support. They're also three electorates with high turnout, which in turn helps to maximise the impact of your party vote in those electorates, just as the Green Party has demonstrated. As I mentioned earlier, TOP simply didn't register as an option for voters in most of Auckland with only Auckland Central, Mt Albert, and Epsom recording a higher share of party vote in their electorates than TOP achieved across the country. With such a Wellington centric focus to the party both in terms of the personalities running it, and the almost technocratic devotion to policy, it's hardly surprising that they bottomed out in our biggest city. I'm not sure that Gareth Morgan running in an Auckland electorate could have solved this. Auckland Central could have seen him play as a spoiler against Nikki Kaye, but given Gareth Morgan's ability to put his foot in his mouth when it came to women this campaign, it may have hurt him more than it helped him. Mt Albert would have seen Gareth Morgan come up against Jacinda Ardern and Julie Anne Genter, which wouldn't have been much better than him. All of that leaves Epsom as a possible option for him. The race would have enjoyed a high profile thanks to David Seymour and the deal between National and him, and while Epsom sits near to the average of turnout, it could have been a good base for Morgan to lift TOP's vote in neighbouring electorates too. I suspect though that, like the Greens, the technocratic nature of TOP would have hindered these efforts, meaning a much lower return on effort than had Gareth Morgan run in Wellington. Accept that they are going to be a technocratic party and set out to ruthlessly maximise their vote in key electorates to offset their under-performance around the country. This will involve Gareth Morgan picking an electorate and running in it. Though at 64, unless Gareth Morgan is planning to do a Winston Peters and stick around in politics well past the age of super, though could be in trouble unless they're able to find a personality as big as Gareth Morgan's to fill his void once he steps aside. Of all the parties I'm examining this week, the Green Party is the most dependent on a handful of seats to deliver the lion's share of its party votes. For a small party this is both a useful situation to be in - you can narrowly focus your limited resources to maximise your success in those electorates - but it's also a big risk. If, as they did this year, events spiral beyond your control and they start hurting your support, your dependent on a handful of electorates could be disastrous. 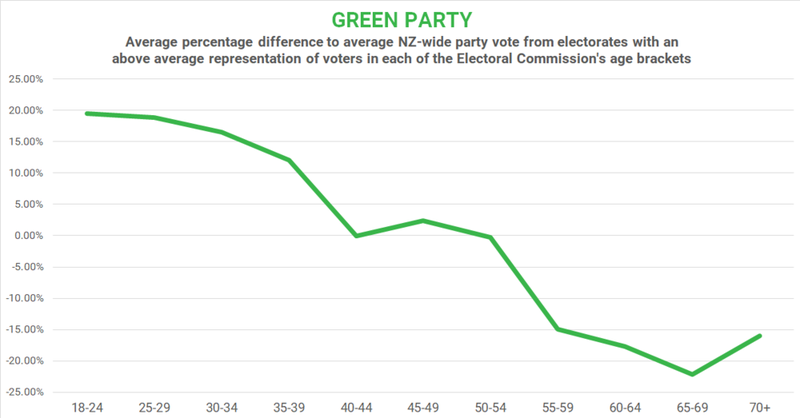 It's no secret that the Green Party does well with young voters, and of their 10 most valuable electorates only Port Hills, Ohāriu, and Nelson have below average populations of 20-29 year old voters. (I haven't had a chance yet to overlay enrolment data for 2017 so in this case am working off Parliament's electorate profiles data for 2014. I'll endeavour to revisit the enrolment data again soon). When looking at where the Green Party's least valuable electorates are, there's not many surprises here either. With Labour having strong support across the low turnout electorates in West and South Auckland, the Greens haven't really made any traction here. The Greens were also hurt in the Māori electorates where they typically do pick up reasonable levels of support, so to see three of them in the Greens 10 least valuable electorates was a bit of a surprise, though on reflection they would have also been impacted by Labour's resurgence in the Māori seats this election. The Green Party's strengths are obvious, electorates with plenty of young people, as well as generally urban electorates. It suggests that the oft-touted myth of the Greens depending on urban liberals isn't that far from the truth. Nelson is a slight outlier in that regard in that it'll have more of a rural influence, but looking across the board, the Greens are hugely dependent on urban voters, meaning that when they're making policies that'll impact rural voters, they know that those people aren't likely to be voting for them in meaningful numbers anyway. This is also where the Green Party's opportunity lies. With such a narrow voter base both demographically and geographically, the Greens need to look for similar electorates to broaden at least the geographic aspect of their support, so that they're less vulnerable to swings in Auckland, Wellington, Christchurch and Dunedin. Places like Palmerston North and Hamilton East would be good places to start. With higher than average youth populations, as well as universities, they're both places where, if the Green Party can play down its lack of rural support, there could be more support for them. Other electorates in the mix could include Wigram, Mt Roskill, or Hamilton West, which all have well above average youth voter pools to draw on. Even more so than the National Party, New Zealand First relied on a handful of seats to deliver the bulk of their party vote this election. In terms of New Zealand First's most valuable electorates, there's nothing particularly surprising here. Whangarei benefited from Shane Jones' high profile candidacy, while Winston Peters himself helped New Zealand First slightly grow its share of the party vote in Northland. Tauranga, Bay of Plenty, and Coromandel probably benefit from higher than average numbers of voters aged over 65, and for the first two probably a bit of legacy support for when that was Winston Peters' voter base. Waiarapa also has an above average grey voter base, but also features New Zealand First's deputy leader, Ron Mark. While Rodney has their former deputy leader and relatively high profile MP Tracey Martin as their candidate, which are also likely to be factors. Of note, New Zealand First only managed to grow their share of the party vote in three other electorates - Clutha-Southland, West Coast-Tasman, and Tukituki. Of those three other electorates where New Zealand First grew their share of the party vote, none of them ran New Zealand First candidates back in 2014, so there's possibly a lesson there about ensuring you run candidates in as many electorates as possible to maximise your exposure. The other area where New Zealand First's most valuable electorates echoes National's top electorates is that they're all high turnout electorates, and actually average a slightly higher turnout than National did. As for New Zealand First's least valuable electorates, nothing here particularly stands out either. It doesn't surprise me that the more cosmopolitan parts of New Zealand are also the least likely to vote for New Zealand First. No guesses for why that might be either. Electorate strength for New Zealand First clearly depends on both the popularity of Winston Peters, but also the ability of high profile candidates to turn out older voters in support of the party. This strength is also their greatest weakness. The party's existence seems to largely depend on Winston Peters own fortunes, and if they're down, then the party is out, so closely are the two brands aligned. As to what opportunities that presents for New Zealand First at the electorate level? It's a hard one. If we assume that Winston Peters is going to contest the 2020 election (and it's entirely possible he might), then New Zealand First needs to identify electorates that share characteristics with their 10 most valuable and maximise their party votes there too. Some possibilities include Kaikoura, Ōtaki, Waitaki and Rangitata. These electorates also represent an opportunity for New Zealand First to transform itself from a platform for Winston Peters into a party representing rural New Zealand, a niche exploited relatively well by the Nationals in Australia. Labour might dominate the party vote in South Auckland, but low turnouts mean other urban centres were far more valuable to Labour this election. It feels like every election we hear about how Labour is just waiting for the South Auckland booths to come in to boost their party vote tally, but the reality is that despite dominating the party vote at the electorate level in much of South and West Auckland, low turnout rates - some of the lowest in the country - mean that those seats simply aren't as valuable to Labour's success as elsewhere in the country. Final results from the 2017 election reinforce this, with Dunedin and Wellington both featuring as key areas where Labour did well. While both Dunedin South and Dunedin North are both mid-pack regarding turnout, both are still above average in this regard. Where Labour really shone though was throughout the Wellington region, with Rongotai, Mana, Rimutaka, and Hutt South. Wellington Central was Labour's 13th most valuable electorate despite Labour only picking up 38.22% of the vote there due to it being the fourth highest electorate for turnout. It's also worth pointing out that both Nelson and the Port Hills, two high turnout electorates, also experienced the second and third highest net swings to the centre-left this election. These should be taken as huge positives for Labour, and they need to look at what they did well there and see if they can't translate it to other similar electorates around the country. Mt Albert was Labour's 11th most valuable electorate and the only electorate for Labour in West and South Auckland to record above average turnout, coming in at 31st place for turnout. Labour won 43.19% of the party vote in Mt Albert. Manurewa was 12th most valuable, and 62nd for overall turnout. Labour won 58.40% of the party vote. Kelston was 15th most valuable and 60th for overall turnout. Labour won 50.18% of the party vote. Maungakiekie was 16th most valuable and 51st for overall turnout. Labour won 43.19% of the party vote. Te Atatu was 17th most valuable and 55th for overall turnout. Labour won 43.19% of the party vote. Mt Roskill was 19th most valuable and 52nd for overall turnout. Labour won 42.43% of the party vote - this was the only electorate in this list where National beat Labour for the party vote, getting 42.75%. And New Lynn was 21st most valuable and 58th for overall turnout. Labour won 42.50% of the party vote. It's important to note that West and South Auckland still delivered about 18.7% of Labour's overall party vote, so they're they still form a core of Labour's dependable vote. However, Labour's inability to translate that electorate dominance into much higher turnout rates is going to prove a thorn in Labour's goals of being a party that polls in the low to mid 40s. Unlike National who win big in high turnout electorates, Labour has to deliver above average performances across a wider number of electorates to make up for the fact that their core areas simply don't have the same high turnout that National's do. This means that whereas National's top 20 electorates delivered some 39.7% of their vote total, Labour's top 20 delivered 35.3%. That gap widens again when you compare the top half of electorates for each party, with National netting 67% of its votes from its top 36 electorates, while Labour only manages 59%. In terms of Labour's least valuable electorates, I don't think there's much surprising in this. Labour does get slightly more of its votes from its 10 worst electorates that National does (9.73% for Labour versus 8.85% for National). This generally reflects that Labour's vote has a slightly better spread across the country than National's. The hallmarks of Labour's bottom 10 electorates, other than being generally considered safe National seats, is that they're either rural, affluent, or both. Taranaki-King Country, Clutha-Southland, Hunua, and Waikato all obviously fall into that rural category, while East Coast Bays, Pakuranga, Tamaki, Epsom, Helensville, and Botany into the affluent one. There's obviously exceptions to that rule in each electorate, but it's a useful generalisation to see what's going on. With a slightly above average turnout in these bottom 10 electorates it does demonstrate why Labour puts such a big effort into trying to get out the vote in the electorates that it does dominate, even though it doesn't seem like those efforts are delivering much in the way of lifting overall voter turnout, especially across West and South Auckland. Labour's strengths are clear. They have a dependable, if not particularly high turnout, party vote base in West and South Auckland, and success in the higher turnout electorates around Wellington bodes well for them. Labour's weaknesses are also clear, with low turnout rates throughout Labour's supposed base in West and South Auckland, they're more vulnerable to movements elsewhere in the country. As for opportunities for Labour? I mentioned earlier that Port Hills and Nelson experienced the second and third largest swings towards the centre-left (New Plymouth was the top swing electorate), and I think that this is one area Labour should push further on. For example, New Plymouth had the largest swing (any coincidence that Andrew Little wasn't running in the electorate anymore? ), yet Labour's share of the party vote there was still only 34.04%. As a provincial city, it shares similar characteristics with Nelson, so there could well be more room for Labour to grow there. Given their success around Wellington too, Labour should be looking at high turnout electorates like Ōhāriu and Wellington Central and looking to increasing their share of the vote there too. Growth here doesn't necessarily have to come at the expense of the Green Party either, though its high performance in both those electorates suggests it inevitably will have some impact, but should aim to eat away at National's support and the good results The Opportunities Party recorded in both seats too. However Labour's biggest opportunity, as ever, is to figure out how to hugely lift voter turnout in West and South Auckland. If they can find a way to do this, Labour can create a red hinterland not dissimilar to that National enjoys in its strongest electorates, which would easily lift Labour into the low to mid 40s, and do so without cannibalising the Green Party, which would be a net benefit to the centre-left as a whole. Big party vote wins in 10 key electorates with significantly higher than average voter turnouts proved to be the backbone to the National Party's remarkable 44.4 per cent party vote total. I've decided to kick off a series looking at the most and least valuable electorates for National, Labour, New Zealand First, the Greens, The Opportunities Party, and the Māori Party to see if they dispel, or confirm, some of the commonly held myths about our political parties, as well as looking at some of the strengths, weaknesses and opportunities they present to the parties. To do this I've looked at the top 10 and bottom 10 electorates for each of those parties in terms of how many votes they contributed to their party's overall party vote tally. I'll work through the parties in order of party votes received this election, so we'll kick off with National. It's clear that the backbone to National's support confirms the commonly held perception that affluent and rural areas back National heavily. So no surprises there. What I think is interesting though is how high the turnout is in those electorates too. The top two electorates for voter turnout - Rodney and Selwyn - delivered National 15.16 percentage points (pp) and 14.61pp more party votes than National would get on the night. Even in Waikati, the third highest turnout where National's share of the party vote was the lowest of their top 10 most valuable electorates, it was still 9.40pp higher than the end result. Those top 10 electorates delivered for National 20.96% of their overall party vote tally this election, despite only representing 15.8% of overall party votes cast across the entire country. National's ability to not only win big in terms of party votes, but also in terms of turnout in these 10 seats. You'll see later this week that Labour has the opposite problem, in that its support is somewhat more evenly spread out around the country. Unsurprisingly, the seven Māori electorates are the seven worst performing electorates for National, with Te Tai Tonga delivering National 12.47% of the party vote in that electorate being the only standout. But as National doesn't campaign in those electorates I've removed them from this analysis as it doesn't really tell us anything we didn't know before hand. Where things get more interesting is when you start to look at National's least valuable electorates outside of the seven Māori electorates. Manukau East, as I've written previously, was the sole electorate in the country to experience a swing to the right. While that, and the fact that National also grew their party vote in Manukau East too, will be welcome news for National, it's also National's second least valuable electorate in the country (excluding the Māori electorates as discussed above). Likewise other electorates where National did grow their share of the party vote in Auckland like Māngere, Manurewa, and Kelston, are all electorates with some of the lowest voter turnout rates. So again, National can be pleased it's won some extra votes in those seats, they're not in big enough quantities to make a meaningful difference. What is interesting is that of the top 10 electorates for turnout, only Wellington Central makes an appearance in National's least valuable seats. When you start to look at the broader picture, 39.7% of National's support comes from its top 20 seats, and 67% of it comes from half of all electorates, illustrating just how dependent National is on those electorates with large turnouts voting for National in large numbers. While this is clearly a strength of National's, it's also their key weakness. Should they lose even a few percentage points of support in those key seats, it has a much larger effect on National's overall prospects. If you were Labour looking ahead to the 2020 election, you'd be asking yourself the two questions of how to you maximise your own turnout in your safe seats, but also how can you steal back some gains from National in what are some pretty clearly defined geographical areas, the rural fringes of Auckland and the inner city suburbs of Epsom, Tāmaki, and the North Shore. What ties all these electorates together is that they all have much higher than average voter turnout rates, and they all party voted for National at a higher rate than the rest of the country. I think Whangarei and Northland could be very interesting in that regard, as with Shane Jones and Winston Peters respectively in those electorates, they boosted New Zealand First's party votes there too, meaning that if New Zealand First implodes this Parliament, then National stands to benefit greater. Coromandel, Ōtaki, Wairarapa, and Taupō electorates are all what should be strong, provincial electorates for National, and Coromandel and Ōtaki in particular should lean that way further through a combination of rapidly aging populations and in Ōtaki's case especially, some massive infrastructure projects in the works over the coming five years. The post-election period is always an odd one for political social media, and with the added bonus of coalition negotiations and pre-positioning going on, 2017 is proving no exception. MPs, Party Leaders, and the parties themselves, need to walk a fine line to get the tone and quantity of their posts just right, depending on how they fared during the campaign. For Bill English and National the challenge is celebrating what was a very good result for a party looking to get a fourth term in government, but also not being too triumphant about it, especially knowing that it could all be for nought should they not be successful in coalition negotiations. It's also especially important that they're also seen to be getting on with business, as much as they're able to in a caretaker environment. For Jacinda Ardern and Labour it's about acknowledging what was a good turn around from the start of August, but also balancing that out against the reality that the momentum was sucked out of their campaign in the final week and a half, and a significant part of that was self-inflicted over a poorly executed tax policy double u-turn. Much of what Labour has and will do is about trying to put that behind them and focusing on the positive result and the expanded caucus it's brought them. Things are a little different for the Greens and New Zealand First. Behind the scenes the Greens will be relieved that they'll finish relatively well clear of the 5 per cent threshold, but publicly they need to keep up the morale of their supporters who will feel a bit beaten up from the last two months. Also, James Shaw needs to post something. As the sole leader of the Greens until their next leadership election, he should be making himself more visible, not less, in order to plug that gap until it's filled. For Winston Peters and New Zealand First I'll throw conventional logic out the window, purely because they've never really bothered about it before. Winston Peters in particular has carried on, and frankly should carry on, exactly as he did before the election. It's worked for him. Attack the media, attack National and Labour, use social media to amplify the attention your often pugnacious comments get. As for David Seymour and ACT, it's a tough one. In either coalition arrangement it's unlikely David will get any portfolios or policy concessions, and ACT's signature achievement of Charter Schools is likely to be under threat should Labour form the core of the next government. David has to seem circumspect about ACT's poor election performance, but he's also doing the right thing heading around the country to thank their candidates and supporters, who will be feeling pretty down in the dumps from that result. For the Māori Party hopefully someone will reactivate their Facebook page soon! As for how they're performing statistics wise? Oddly we've had a reversal of the final weeks of the campaign. Whereas Bill English and National were ascendant, now it's Jacinda Ardern and Labour who are posting more than twice as much as Bill English and National, as well as receiving significantly more engagement on their content. To me that suggests that National and Bill English may have spent more in advertising their Facebook content in those final two weeks than Labour did, but we won't get a proper view about each party's digital spend until election spending returns are made available in early 2018. Certainly though, Labour and Jacinda Ardern have been enjoying the lion's share of the running since the election on Facebook. It can be hard to find content over this period, but some easy ideas include introducing your new MPs, offering a behind-the-scenes view of what happens when someone becomes a new MP, and hunting through the screeds of video and photos taken throughout the campaign and finding some highlights. Labour have done a reasonable job of celebrating their new MPs, and I've seen plenty of good examples of new MPs sharing their perspective on their new responsibilities - including more photos of the Members' Bills biscuit tin than I ever thought was possible! When they're sitting down for coalition negotiations over the coming days, Bill English and Winston Peters should raise a glass in honour of Colin Craig, the man who saved both their parties this election. Well, I'm exaggerating a bit there. But an analysis comparing preliminary results from both the 2014 and 2017 elections suggests a correlation between electorates where the Conservatives won a high share of the party vote and the electorates in 2017 which comparatively contributed more to the final overall party vote totals of National and New Zealand First this election. The idea is simple. In 2014 approximately 95,000 New Zealanders voted for the Conservative Party led by Colin Craig. In the preliminary results on 20 September 2014, that figure was 86,616. In 2017's preliminary results that figure had dropped to just 5,318. On election night there were some 81,298 voters who had left the HMNZS Colin Craig in those three years, and I wanted to find them. There were a few assumptions that were easy to make. I thought it was pretty unlikely many of them would have switched their votes to Labour, the Greens, or even The Opportunities Party given TOP's liberal stance on marijuana. The issues that motivated voters to cast their ballots for the Conservatives were predominantly social issues that they had a conservative take on. That meant there were only three likely parties for those votes to go to. Given ACT got so few votes, it was clear they hadn't all rushed there. Plus ACT under David Seymour emphasises a more libertarian ideology than say the ACT of John Banks or Richard Prebble which had a healthy does of social conservatism mixed in with its Rogernomics bent. That left only National and New Zealand First as the two contenders for those votes. National under John Key was a fairly socially liberal party, but Bill English, as a Catholic, does have a socially conservative streak in him. Likewise New Zealand First and in particular Winston Peters, have always appealed to the protectionist, anti-outsider, harking back to the good-old-days mentality that is commonly associated with voters of a conservative nature. And, if overseas experience teaches us anything, those of a conservative nature aren't shy about voting, so I didn't expect them to stay away in large numbers. What I wanted to see specifically though was whether this translated into my previous examination of the changing party vote share in each electorate between the two elections. Maybe I'd missed something. Could National's stronger than expected (and Labour's weaker than expected) results in Auckland be explained purely off Conservative voters bulking up the ranks of National and New Zealand First. The answers surprised me. As you might imagine, there seems to be a pretty clear correlation that generally shows that in electorates where the Conservatives did well in 2014, then those electorates managed to contribute more to the overall party vote totals of National and New Zealand First than they did in 2014. And bare in mind that this is off preliminary results from 2014 and 2017, so I'm trying to compare apples with apples as much is possible across two elections. In case you can't expand the above image, the light blue line is the share of the party vote that the Conservatives received in each electorate in 2014. The dark blue and grey lines is the percentage change of how those electorates contributed to National and New Zealand First's overall party vote in 2017 compared to 2014. If the lines jut out to the right it means that electorate has contributed a greater share to the party's overall party vote than it did in 2014. If it's to the left, it contributed less overall. Where I'd earlier just looked at individual electorates in isolation, this allows us to compare electorates within the context of the overall party vote. So I'll dig more into this later. As you can see in the above image (if you need a bigger version feel free to contact me) where the Conservatives got over 4.47% of the party vote in an electorate in 2014 (that's Waitaki in the above) there appears to have been enough support transferred to National and New Zealand First in 2017 to shore up their support. As New Zealand First needed fewer of those Conservative votes in each electorate to prop up their party vote numbers, I have to wonder if there was a bit of a churn cycle going on as National sought to replace the support it was losing to Labour. This cycle would see Conservative voters largely going to New Zealand First and some to National, but New Zealand First shedding voters towards National, especially in the large rural or provincial city electorates where National made a big push during the campaign. Where the Conservatives got 4.47% they generally don't seem to have had enough votes to protect National or New Zealand First. Notable at the bottom of the list are Wellington Central, Auckland Central, and Mt Albert, all places that were in the top 10 locations that Labour grew its party vote relative to 2014. Where things start to get interesting too is that this highlights the importance of National's performance in West and South Auckland outside of just collecting former Conservative and New Zealand First voters. Looking at the top 10 electorates where National grew it's share of the party vote relative to 2014, only Botany and Pakuranga sit above that tipping point where the number of Conservative voters was high enough to protect National and New Zealand First. What's also worth noting about all of those electorates is that they have some of the worst voter turnout rates - if not the worst - in the country. It means that not only did National manage to capitalise on Labour's weaknesses with ethnic communities and potentially the mortgage belt in Auckland, but also Labour simply was not able to turn out voters with nearly all of those electorates down in total votes in the 2017 preliminary results compared to 2014 (only Botany and Te Atatu recorded more preliminary votes) which seems incredible when you consider that there should be more people living in those electorates relative to 2014! There's a few outliers in the data. New Zealand First's Clutha-Southland performance for one, which I suspect is driven by other, more recent events in that electorate, while Northland and Whangarei were likely driven by the presence of Winston Peters and Shane Jones respectively. That's enough for now! Will churn through some more insights from this dataset soon hopefully. And obviously I'll try to re-run this analysis to to compare the final results from 2014 with the final results from 2017. While Bill English comfortablely defeated Jacinda Ardern on Facebook this election, it was a much closer contest between National and Labour. All of the early momentum was with Labour, and National only managed to turn the tide of interactions with content by the sixth week of the campaign, whereas Bill English had already managed that three weeks earlier. Once National did gain the lead though, they echoed Bill English's success in significantly outperforming their rival over those final two weeks while advance voting was open. Off the back of Jacinda Ardern's boost to Labour's fortunes, Labour took just three weeks to overhaul National's page like lead on Facebook, a lead it had held and grew since 21 September 2014. TOP advertised heavily (remember that campaign about Gareth Morgan saying he'd rather donate $1 million to charity rather than running political ads?) and more than doubled their opening numbers, while National progressed along comfortably. ACT, surprisingly, did well relative to their size, a trend that was matched by David Seymour in the party leader statistics too. As you can see, both National and Labour were pretty even across the entire campaign. A similar number of posts, with similar numbers of interactions on their posts. National beat Labour with reactions and comments, but Labour had more shares. TOP, again likely boosted by a big online advertising spend, did well here, so it'll be interesting to see how that comes out in the wash when all the parties have to declare their election expenses. I should also point out that the reason why I included the Māori Party in these statistics, but not its leaders, was purely out of budgetary considerations on my part. I just can't afford the extra cost to monitor more accounts on the tool I'm using (quintly.com) just yet. When you look at how the campaign played out week-by-week, you can see just how dominant Labour's advantage was in those early weeks. You could almost make a claim that taken along with the data from yesterday that this does somewhat mimic the general drop then rise of National (and vice-versa for Labour) over that time, but I think that's probably pushing things a little. There's no doubt that a good social media strategy makes communicating your campaign messaging that much easier (and conversely a bad social media strategy will cost you), but there are so many other things that impact on campaigns that social media is just one influence to account for. What is interesting though is the strong push by National over those final three weeks, especially the final two when advance voting opened. Comparing both Bill English and National vs Jacinda Ardern and Labour, Bill and National posted 46% more content over those two weeks than Jacinda and Labour. What's more, Bill and National received 82% more interactions on their content than Jacinda and Labour did. As I mentioned yesterday, National's most popular video (and I suspect most popular post) was "Bill's story" which netted 935,000 video views. Labour's most popular video surprisingly didn't feature Jacinda Ardern, but rather Sir Michael Cullen promoting Labour's fiscal plan that received 448,000 views. The Opportunities Party also did well with 428,000 people watching "The Great Kiwi Tax Break". Bill English's Facebook page outperformed Jacinda Ardern's when it mattered in the final five weeks of the election, despite getting off to a slow start and not adding as many new page likes. The reason for this is simple - more people interacted with Bill English's Facebook page content over the course of the election campaign, meaning that it's likely his page reached a significantly higher number of voters than Jacinda Ardern's did. In a normal campaign I'd of taken my statistics from the start of the Regulated Period, as this is effectively the start of campaign season. However due to Labour's change of leadership, I decided to take statistics from 1 August, when Jacinda became Labour Party Leader, as otherwise things would be tiled hugely in Bill English and National's favour given she didn't even know she was going to be leader up until the night before. On average across the campaign Bill English's Facebook page was 24% larger than Jacinda Ardern's. The gap started at 43% larger and edged it way down to 13% by the close of the campaign. 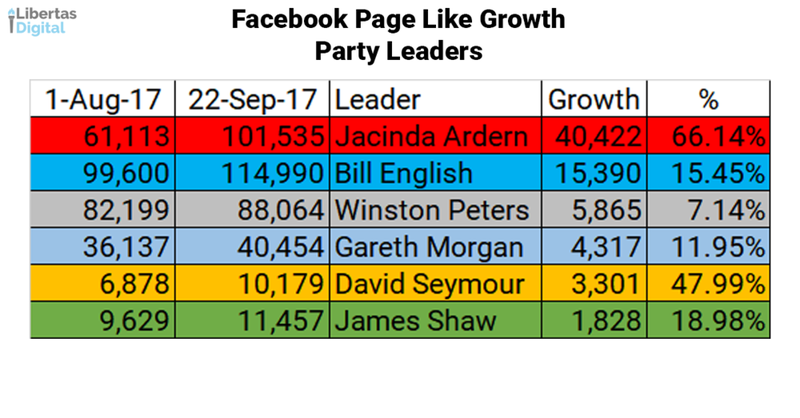 Jacinda's page like growth shouldn't be discounted though, it's hugely impressive given she went from a standing start (and the above figures don't include the boost she got from speculation about the leadership on Monday 31 July) she definitely is the top performing page for growth during the 2017 campaign (though Bill English still holds a 7,500 lead across all of 2017. The larger size of Bill English's page throughout the campaign accounts for about 70% of the difference between the performance, however 30% of it is purely down to the quantity of content Bill English published and how well it did. Bill English posted 91 times more than Jacinda Ardern did from 1 August through to 22 September, a 67% difference, which proved significant given the lower interaction rate per post that I've found centre-right parties experience. With more reactions, more comments, and more shares in total, it gave Bill English more of an opportunity to reach people across the campaign period. Across the 53 days I've covered, Bill English posted on average 4.3 times a day while Jacinda Ardern only managed 2.5 times a day. In part I suspect this reflects the divergent campaign strategies that each leader used. Bill English held multiple, smaller, and more free flowing events each day, while Jacinda Ardern favoured fewer, but larger and more orchestrated events. As for the other leaders, there's not too much to get excited about. Winston Peters has typically done well on Facebook. Given the intense focus on Bill English vs Jacinda Ardern, and Winston's own near invisibility on the campaign trail this year, it's perhaps not surprising that he hasn't done quite as well as he might have done. Gareth Morgan benefitted from his high profile and, I'm guessing, some serious advertising dollars behind put behind his content. David Seymour was busy, but struggled to find traction with his 221 posts - the second most behind Bill English - while James Shaw was very, very quiet. Though the Greens have typically invested more into their overall Party brand on social media than individual leaders. Where things get interesting though is when you look at how the balance changed between the two accounts over the eight weeks. Off the back of her elevation to the leadership, Jacinda's page wiped the floor with Bill English, which isn't surprising given the level of media coverage surrounding her at the time. Where things get interesting though is how quickly that tapered off during the campaign so that by the fourth week Bill English was doing better across all measures other than interaction rate and like growth, and it would largely remain that way for the rest of the campaign, with Bill English really shining in the second to last week as Labour came under immense pressure for its tax policy, and Steven Joyce launched his infamous fiscal hole attack. You can see above that barring her first two weeks as leader, Jacinda would never again get more interactions on her content than Bill did. The real hammer blows in terms of Bill generating more audience reach out of these interactions would have come in weeks five, seven, and eight, where his page experienced nearly double that of Jacinda's. The final two weeks were crucial, as they were the weeks that covered advance voting. As Kiwis went to cast advance votes in record numbers, there's a good chance that most of them would have seen content from Bill English or, as I'll demonstrate tomorrow, the National Party. The two leaders most successful posts of the election appear to be Jacinda Ardern's visit back to Morrinsville with 1.2 million video views, and Bill English's "My story" with 305,000 video views - on the National Party page it was posted separately and received another 935,000 views there - meaning it's just edged out Jacinda's trip down memory lane as the most watched video of election 2017. Tomorrow I'll have a look at how each of the political parties performed during the campaign. Auckland has become the National Party's firewall as demonstrated by their ability to either grow or minimise party vote loss across all but five of Auckland's 22 electorates. What's interesting about this relative to Labour is that it illustrates that Labour has largely taken party vote share from the Green Party to achieve its gains North-Western Auckland, while Labour has hurt National directly in Auckland Central and the directly adjacent electorates of Mt Albert, Epsom, North Shore, and Tamaki. As shown in my analysis of Labour's failure to mobilise its voters in West and South Auckland, these areas nearly all grew National's party vote share relative to 2014, barring Maungakieie (which only dropped 0.15% points). And 12 electorates actually grew National's share of the party vote, though Hunua and Upper Harbour could easily tip in a the above category once special votes are counted. To win an election in New Zealand you have to win in Auckland and Labour simply didn't do enough winning in the City of Sails. As I wrote last night, Labour's campaign failed completely in West and South Auckland, and only performed well - growing its party vote at or above its average nationally in six out of the 22 Auckland electorates - all electorates that you'd typically define as relatively urban and/or affluent. Conversely, of the 12 electorates where National actually grew its party vote across the country on Saturday night, they run in a corridor starting in Upper Harbour and running through West and into South Auckland. Where Labour did particularly well is in Mt Albert and Auckland Central which almost certainly has to do with Jacinda Ardern. In Mt Albert the result will have been bouyed by her being the local MP as well as Labour Party leader, and voters generally tend to reward that (though not always). In Auckland Central I suspect what we're witnessing is similar to what was seen in Wellington Central, where there wasn't so much as a youthquake, so much as a youth seismic swing, where youth voters (defined as those 34 and under), and especially students, have switched their votes from National and particularly the Green Party, in behind Labour. Once we get special votes in and enrolment numbers for those electorates, it'll be interesting to see how it changes, and whether there was increased enrolment and turnout in student heavy electorates, or just a wave of students switching their votes between parties. ELECTION CALL: Winston will be the kingmaker, the Māori Party will be gone from Parliament, there has been no youthquake, and the next government is likely to be a three way coalition of Labour, the Greens and New Zealand First. Based on my projected change from advance voting results to final vote results - a projection which includes special votes and the distribution of votes from parties that did not make it. My projections also show that Labour is on the cusp of making it to 47 MPs, while National would ease back to 56. That means the split between centre right and centre left is 58 for National and ACT, and 54 for Labour and the Greens and gives New Zealand First the option of forming a government with either National (without ACT) or with Labour and the Greens. As I predicted back in August, I expect Winston Peters to go with Labour and the Greens over National, having twice been nearly destroyed by supporting a third term government, and not wanting to repeat that mistake with a fourth term government. It also seems clear that the youthquake simply hasn't happened, just as I've been predicting over the past week. In case you're curious, here's how the wasted vote redistributed. There's 0.34% lurking around that's up for grabs which could be what makes it a 47/56 split between Labour and National. The youthquake looks to be dead in the water ahead of tomorrow's election with the latest enrolment numbers from the Electoral Commission showing that while there's been improvements in the 25 to 39 segments, the 18-24 segment is well down on 2014, while those over 55 are also well up. Looking at the total makeup of enrolled voters, it shows a clear shift towards grey segments. While the gap has eased somewhat from the 19 September numbers I wrote about earlier today there's still a clear shift in the overall makeup of the electorate towards voters aged 55 and over. The scale of the problem facing any possible youthquake tomorrow evening becomes clear when you put the enrolment numbers through the likelihood to turnout from 2014. Assuming similar rates of turnout across all age groups as 2014, there's still around a 4 percentage point shift towards voters aged 55 an over. To put this in context - a 10 point lift in turnout on those reduced enrolment numbers for the 18 to 39 segments is the bare minimum required just to negate the growth in the grey segments since 2014. That also assumes there's no though it'll be those aged between 40 and 54 who actually get squeezed the most due to the growth of the age segments above them over the past three years, and their higher probability to vote. While there's no official data yet - I believe we might get figures in October - for the scale of Jeremy Corbyn's youthquake, current estimates put it at around 10 points. It's worth remember that Corbyn's youthquake only worked for him because of their FPP system, as overall the Conservatives did drive up their share of the vote to 42% (from 37% in 2015). So while the youthquake was valuable in individual seats, in an MMP system it would have done very little to impact things other than mitigating the likely damage caused to UK Labour. That means that Jacinda Ardern and Labour are hoping on not only a bigger youthquake than Jeremy Corbyn managed, but also lower turnout in those aged 55 and over, or for those aged 40 to 54 to turnout out in favour of Labour more so than they have in their past. Of those, given that our youth turnout has been higher than the UK's, I suspect hoping on a bigger youthquake than what we saw in June seems very unlikely, so they'll now be hoping on those final two things to go their way enough. With all this in mind, I think what we'll see at most is a youth tremor. The good news for Labour is that in such a close MMP election, even a tremor be just enough to tip the numbers in their favour for a Labour, Greens, and Maori Party government. Wishing something is happening doesn't make it so, such appears to be the case with claims that a youthquake is in progress. While youth enrolments might be increasing at greater numbers since writ day than they did in the 2014 election, the overall number of those aged 18 - 24 is well down, and there's only a small increase if you extend that up to those aged 39, on the overall numbers who were enrolled in the 2014 election. What's more, the biggest increases in enrolments since 2014 aren't in the youth segment but in what I call the grey segment - those aged 55 and above. Even if you take likely voter turnout out of the equation, there's still a clear swing in the voting population towards grey voters. You can see that while there's promising signs in the 25 to 34 brackets, the only other growth has been the over 55 segments, meaning grey voters are poised to dominate the election, especially as they turnout in much greater numbers. When you take into account the turnout figures for each age group from 2014, and put that against the 2017 figures so far, you can see what I mean a lot more clearly. Once again there's an overall swing towards grey voters, with their greater numbers and greater propensity to vote, meaning they'll have a bigger impact. If a youthquake was happening it should be showing up in the enrolment data, with more young people enrolling to vote and thus lifting their overall share of the voting population. While there have been signs of that taking place over the past few days which I've written about the problem is that it might be too little, too late, to reverse the drift to older voters. None of this is to say that a youthquake isn't possible, but it's not likely to happen due to surging youth enrolments, which means it's down to those who are enrolled to turnout and vote. As much as I've written about the data not showing a youthquake, I do hope I'm proven wrong, because what matters most to the future of our civic institutions and democracy is that young people participate in our elections to ensure that our government is more representative of New Zealand as a whole, and that political parties are forced to adapt their policies to reflect that reality. It's not a youthquake yet, but those under 39 are clawing back some of the swing towards over 55 voters the latest enrolment data from the Electoral Commission to 19 September shows. The trend towards older voters that was at 4.69% relatively to 2014 when I started collating the data has now edged back to 4.08%. It's hard to see those 39 and under enrolment numbers increasing enough to match the 2014 turnout figures, meaning it's all down to motivating those voters who have enrolled. The problem is that if those age cohorts aren't motivated enough to enrol, it doesn't bode well for getting them to the polling booths, and that is a shame for our democracy.